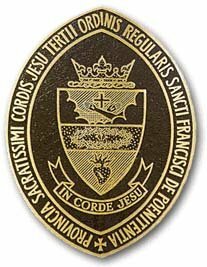 The Franciscan coat of arms consists of a Latin cross surmounted by the right arm of Jesus Christ crossed over the left arm of Saint Francis Assisi. Christ’s hand bears one of the five wounds of his passion. Francis' hand bears one of the wounds of his stigmata. The whole scene issues from clouds. The central section of the seal bears three nails within a crown of thorns, signifying the passion of Christ and denoting penance and conversion. The lower portion of the field is emblazoned with the Sacred Heart of Jesus. 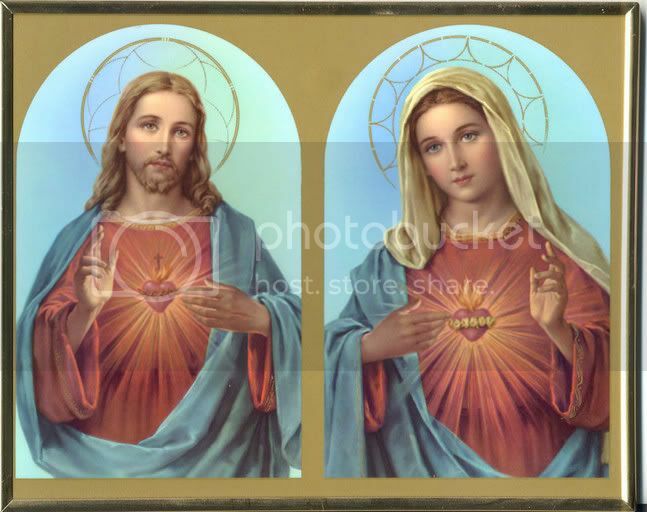 The crescent moon, to the right of the heart, symbolizes Mary, the Mother of Jesus. Beneath the seal is the motto, "in corde Jesu," which is translated, "in the heart of Jesus." Completing the seal is a crown composed of fleur-de-lis representing Saint Louis of France and Saint Elizabeth of Hungary, patron and patroness of the Third Order of St. Francis.